Settling for second place has never been Porsche’s mind set. Porsche has a long list of podium finishes on and off of the racing circuit. In 1948 Porsche scored a first place finish at Innsbruck Stadtrennen with the 356, the first sports car to bear the Porsche name, only one month after it was road certified. Fast forward to 1984 for another notable first – Porsche, with the 911 Carrera 4×4, marks its first victory in the Paris–Dakar Rally. At Porsche safety is just as important as winning races. Porsche becomes the first car maker in Germany to equip all production models with an airbag for driver and front passenger as standard equipment. Now it seems that Porsche has taken the gold again in the form of a limited edition GT Silver Metallic Boxster, the RS 60 Spyder. 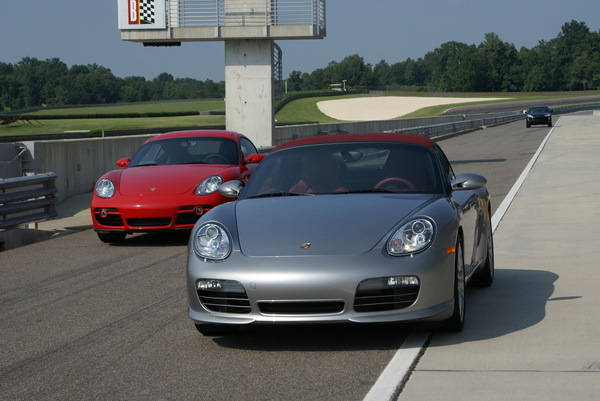 I was given the opportunity to test drive the RS 60 Spyder at the home of Porsche’s Sport Driving School (PSDS), Barber Motorsports Park in Birmingham, Alabama. In my opinion, the race track is the best place to put the RS 60 through its paces without scaring the natives on public roads. 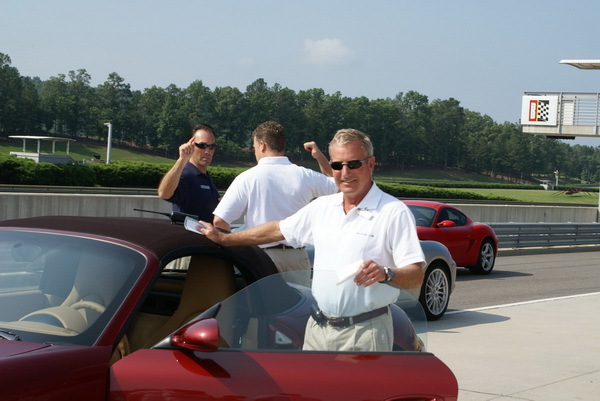 As an added bonus, I had legendary racer and lead PSDS instructor, Hurley Haywood, show me the race line at Barber Motorsports Park. If you are reading this article, the big question on your mind is, “what’s it like driving the Spyder and how does it compare to a Boxster or Boxster S?” The short answer is YOWZA! This rascal zips around corners faster than Lightning McQueen. The beauty of mid-engine sports cars, as with the setup of the Boxsters, are their superbly balanced chassis and front-to-rear weight ratios. Turn-in was crisp and easy to initiate. The Spyder was extremely easy to get around the road coarse whether it was diving hard into a slow tight corner, swooshing through the slalom S-turns, or carrying a lot of exit speed coming out of the carousel. Stability, regardless of road surface, is further enhanced by Porsche Stability Management (PSM) which is standard equipment on all the Boxsters and Caymans. PSM is a computerized system that relies on data from an assortment of sensors to help maintain the car’s intended path as the driver pushes it to the edges of its dynamic limits. And the fun part of being on a closed course is being able to push the limits of the Boxster without being scared of the consequences. I can only imagine the scenarios popping up in my co-pilot’s head, Mr. Haywood, since this was his first time coaching me around Barber M/S Park and he had no clue how good (or bad) were my driving skills. 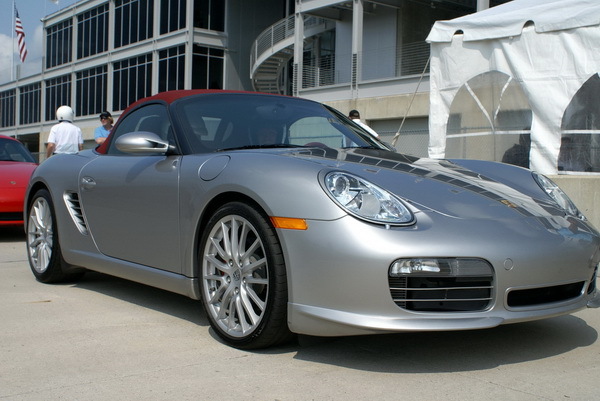 Thank goodness the Boxster’s mid-engine arrangement doesn’t exhibit the tail-wagging properties of the old 911′s. The RS 60 also comes with Porsche’s Active Suspension Management system (PASM), an active dampening system that lowers the body 10mm and gives the Boxster outstanding agility when negotiating the corners (fast or slow). Both the Boxster and I kept our composure while running test laps around the course and all four wheels never left the pavement.